Take time during your Museum visit to enjoy the outdoor garden landscaped with modern plant species whose ancestors lived millions of years ago, often preserved as fossils around the world. 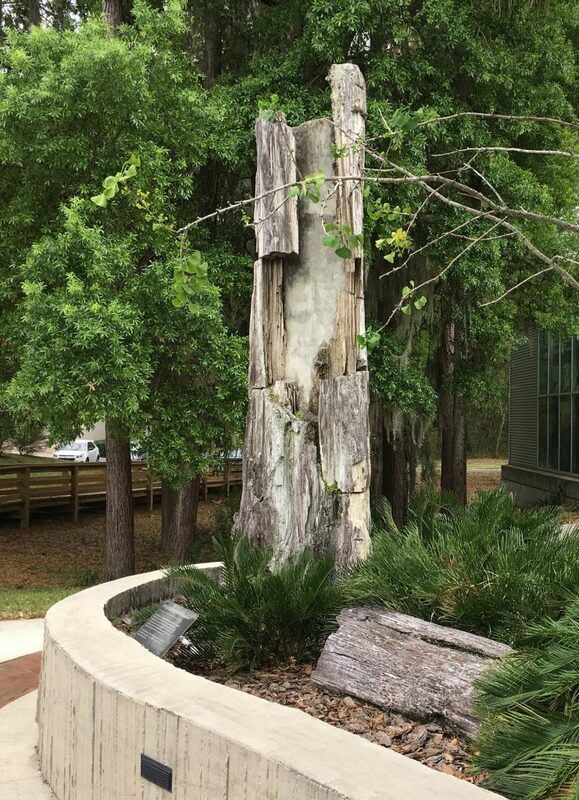 This 8-ton fossil tree from Gadsden County, Florida, is 18 million years old. During fossilization, silica replaced the tree’s organic matter while retaining its shape, bark and even its tree rings. 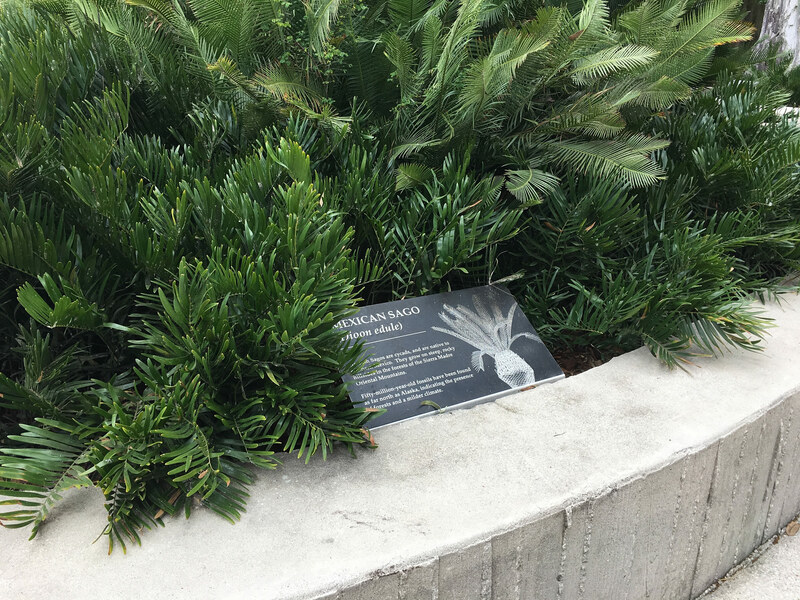 Wander the garden to view plants with fossil histories from 15 million to 425 million years ago. 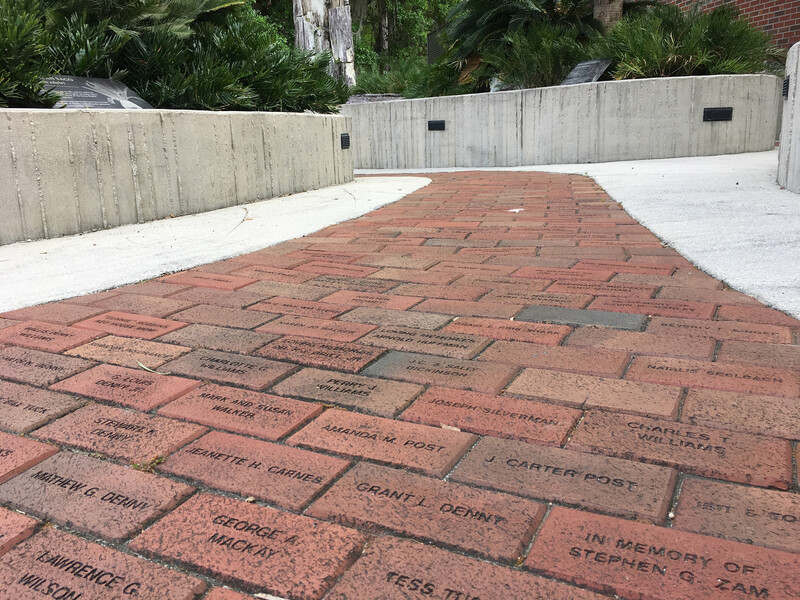 Engraved bricks purchased by Museum supporters line the fossil plant garden walkway. Wander the garden to view plants with fossil histories from 15 million to 425 million years ago. Plants in the garden include mosses, sago and sabal palms, saw palmetto, east and west coast coontie, and ginkgo trees. The garden’s information panels reveal the fossil and modern life history of each species. Some of the garden plants’ ancestors were among the first land plants, and many date to 150 million years ago. The cabbage palm (Sabal palmetto) is Florida’s state tree, native to the southern United States and Bahamas. Palms first appear in the fossil record 70 million years ago during the late Cretaceous Period. They were common in Gulf coast swamps 50 million to 15 million years ago during the Eocene and Miocene epochs. Coontie (Zamia sp.) fossils have been found in 150- 30-million-year-old deposits in the southern United States, Puerto Rico and Argentina. Coonties are cycads and contain toxins that may have evolved to prevent foraging by Mesozoic Era animals.